Sen. Barbara Boxer just issued the following statement. It confirms that “half of the funds for bike paths and pedestrian walkways [will be allocated] directly to local entities,” as spelled out in the Cardin-Cochran amendment. It appears that the “opt-out” provision for states only applies to the half that they control, after local governments have their say. That’s still a blow to the Cardin-Cochran amendment, however, which required states to hold a competitive grant process to distribute their half of the funds. 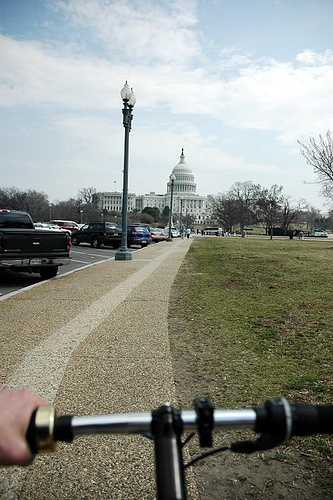 As it is, the amount included for bike/ped in “Additional Activities” under the Senate bill was less than has been allotted to Transportation Enhancements, and included eligibility for many more programs, including some road projects. I am so glad that House Republicans met Democrats half way, as Senate Republicans did months ago. The bill is funded at current levels, and it will protect and create three million jobs. This job creation is the critical focus of Democrats, because we know that the unemployment rate in construction is at an unacceptable level. We speed up project delivery, cut red tape, and do it without jeopardizing environmental laws. For the first time, we send half of the funds for bike paths and pedestrian walkways directly to local entities, and we protect those funds while giving states more flexibility on their share. Our country needs the kind of economic boost that this bill offers, and I am looking forward to getting it to the President’s desk. It is ironic that in June 1956 the Senate passed its first highway bill, and thanks to the work of many committees and all parties, we will not allow that great history of our interstate transportation system to disappear. Also, Boxer’s press secretary needs to learn the meaning of “irony”. What does “directly to local entities” really mean in terms of allocation? Per capita or some other formula? A national competitive grant program? It’s starting to seem that throwing so much money at our failed, polluting highway system is looking foolish. We need to start funding sustainable and appropriate transportation systems, and start collecting toll fees for highway construction and maintenance. Great question. Why can’t I find the answer anywhere? Sen. Boxer indicates that “I am so glad that House Republicans met Democrats half way, as Senate Republicans did months ago.” By my calculation, if she met the Republicans half way twice then she got no more that 25% of what she originally wanted. And it looks like bike/ped programs probably took at least a 75% hit from current law, in terms of both policy and funding. We may take solace in the wisdom of the founders in only creating a bicameral legislative body because if Sen. Boxer were required to meet the Republicans legislative leaders halfway in additional negotiations there would quickly be nothing left. Local government as in cities/counties, or local government as in metropolitan planning organizations? I guess we’ve averted total Bike/Ped catastrophe, but this “compromise” is pretty lame….not too much funding left out of what was already a piddling sum. However, more and more local entities are realizing that it makes financial sense to spend city and state funds to make roads safe for all users. Between the health benefits accrued by walkers and cyclists, to the reduced wear and tear on roads each time you take a car off the road, bike/ped infrastructure investments are looking better every day. saimin, “Thank you, Senator Boxer!” for what? Sounds like meager amount of bicycling and walking funding got cut even more. This will make our roads more dangerous and deprive Americans of transportation choices. I think we would’ve been better off with another clean extension. Once again, it’s up to local advocates to fight to give people more transportation options and for mayors and other local officials to deliver it.